BJP has fielded party president Amit Shah from Gandhinagar, the Lok Sabha constituency L.K. Advani has won six times. New Delhi: No one spelt it out explicitly: Veteran Bharatiya Janata Party (BJP) leader and 11-term MP L.K. Advani, 91, gauged of his own accord that the party wanted to field younger leaders in the Lok Sabha election and bowed out, highly-placed sources in the BJP told ThePrint. Advani, a founding member of the BJP who has served four terms in the Rajya Sabha and won seven Lok Sabha elections, is said to have called up BJP president Amit Shah during deliberations on nominees and expressed his unwillingness to contest. “He cited his health as the reason,” said another source. ThePrint made repeated attempts to reach Advani’s office but there was no response. Since Narendra Modi and Shah took charge of the party, there’s been a push to bring younger leaders to the fore while shifting the seniors to the sidelines. In the wake of the 2014 Lok Sabha elections, former prime minister Atal Bihari Vajpayee, Advani and Murli Manohar Joshi were removed from the BJP’s parliamentary board, its highest decision-making body, and placed in the ‘Margdarshak Mandal’, or advisory group. 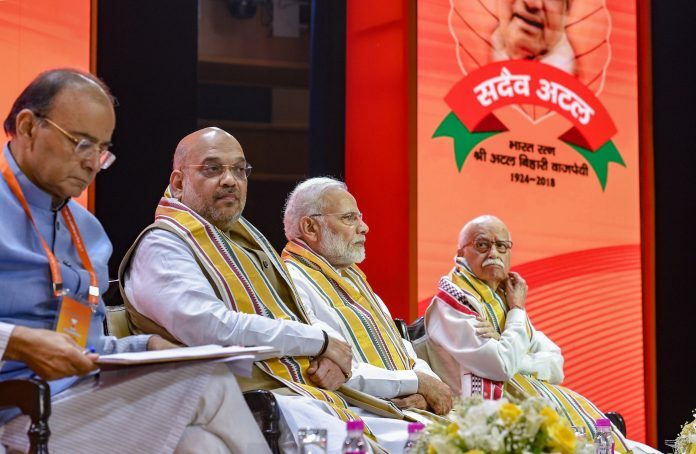 When the BJP Thursday announced its first list of candidates for the Lok Sabha elections, the absence of Advani’s name as the nominee from Gandhinagar, which he has won six times, became the biggest talking point. The BJP has chosen to field Shah, for whom this will be the first shot at a national election, from the seat. Not just Advani, sources in the party claim that Joshi, 85, a six-term Lok Sabha member, is also unlikely to get a ticket again. Meanwhile, former Union minister Kalraj Mishra, 77, has himself excused himself from this year’s poll exercise. “I have decided not to contest the polls, and would rather focus on Haryana, the state of which I am in charge for this election,” Mishra had told the media Thursday. Others who haven’t got tickets include Bhagat Singh Koshyari, 76, who has served stints in both Houses, and Major General Bhuwan Chandra Khanduri (retd), 88, a five-term Lok Sabha member. Both represent Uttarakhand constituencies in the 16th Lok Sabha. Shanta Kumar, 84, a four-term Lok Sabha member and former Rajya Sabha member, is unlikely to secure a ticket too when the BJP announces candidates for Himachal Pradesh. Although much below the informal age threshold, External Affairs Minister Sushma Swaraj, 67, a four-term Lok Sabha member, has also declared her decision to not contest the elections on account of health issues. According to BJP leaders, Modi has an elaborate plan for Shah in the party and, if it’s re-elected, in the government. Shah, who served as Gujarat home minister when Modi was chief minister, is expected to get an important portfolio if the NDA government returns to office. He is currently a Rajya Sabha member. “While a minister could be made from the Rajya Sabha as well, but bringing Shah to the Lok Sabha will send a different message and give more impetus to his position,” said a senior BJP leader. The elevation of Shah to the Cabinet, if that is the plan, will leave the space open for the election of another BJP chief. It would not require the avionics and ISEs of the Rafale to sense the “ wind of change “. An ordinary windsock would be good enough.